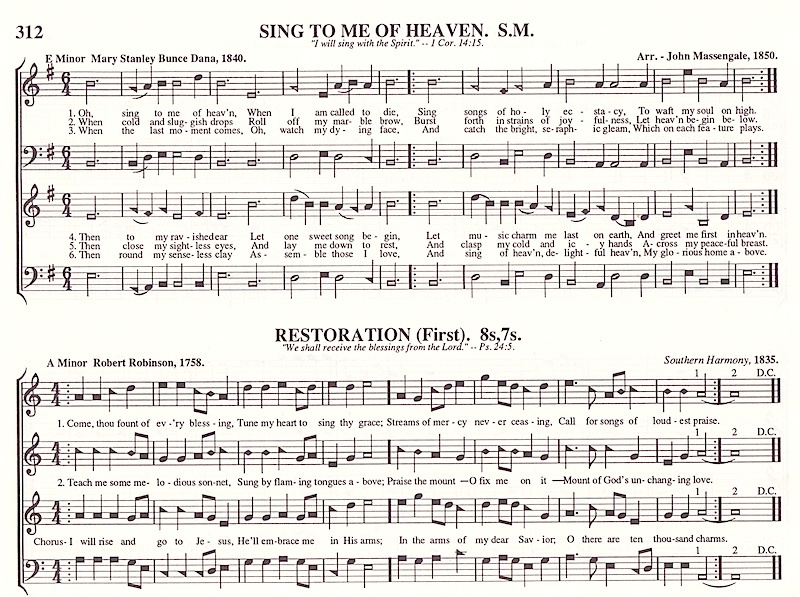 Come Thou Fount of Every Blessing is a Christian hymn written by the 18th century pastor and hymnist Robert Robinson. 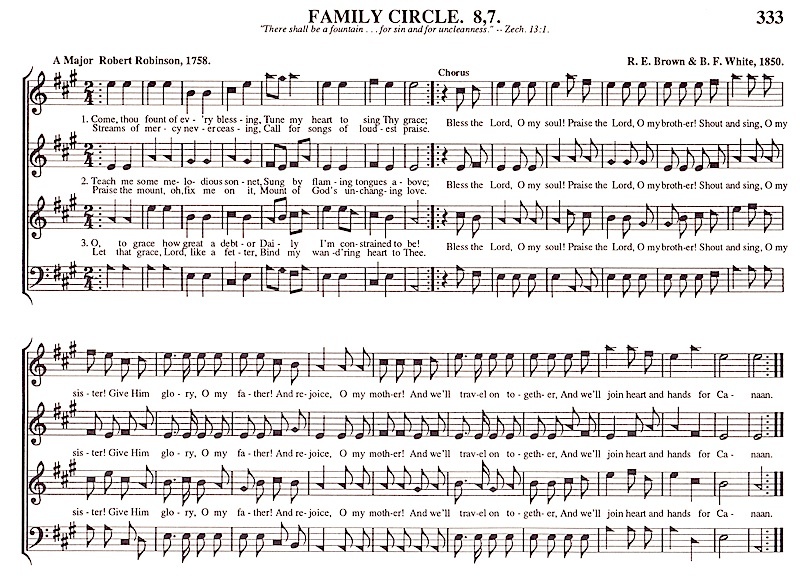 Robert Robinson penned the words at age 22 in the year 1757. 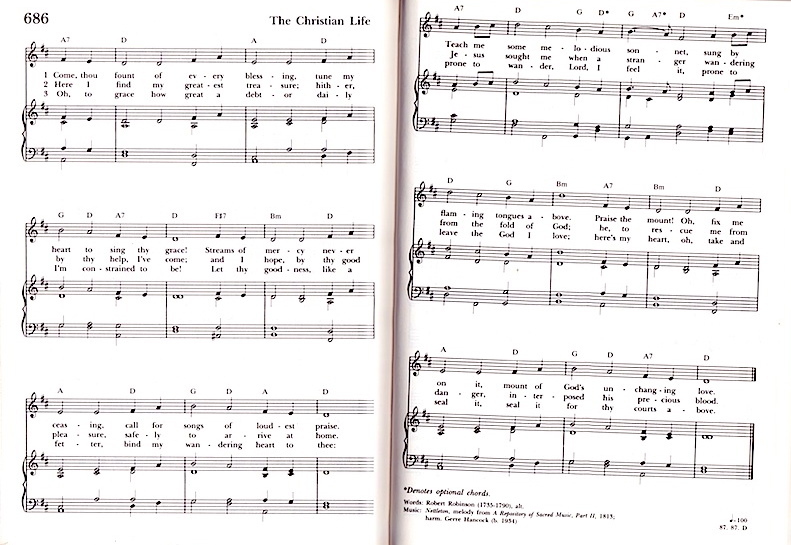 The words of the hymn are in the public domain. I have a pile of recordings of Nettleton, some of them instrumental, others paired with the “Come thou fount” text: by Kate Campbell, David Crowder Band, Chris Rice, Jars of Clay, N’Harmony, Phil Wickham, Sufjan Stevens, London Festival Orchestra / Cumberland Choir, Bluegrass Worship Band, David Huntsinger, Mormon Tabernacle Choir, Saint Paul’s Chamber Choir, Everett Brown (The Steeple on the Common, vol. 2). 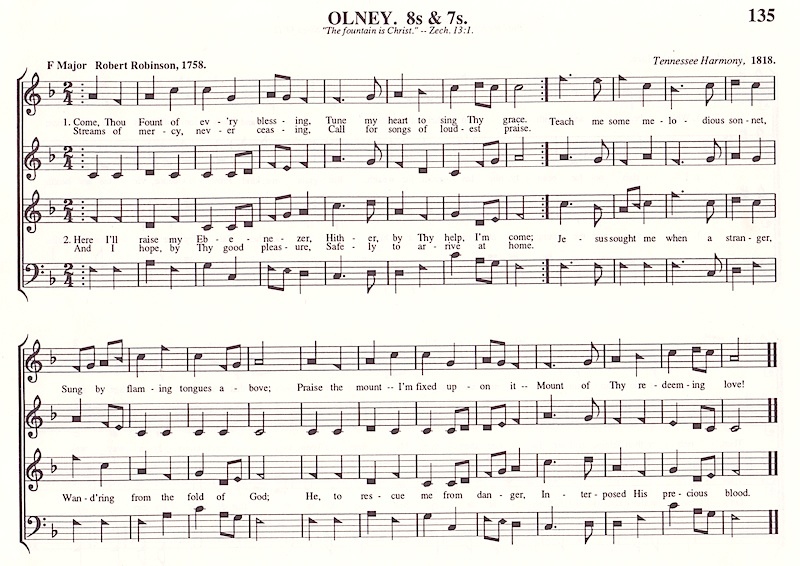 I have three recordings of Restoration (First), one of Olney, four of Warrenton, and none at all of Family Circle. Come, good Shephed, feed thy sheep. Mix and match, that’s the ticket. This entry was posted on December 23, 2011 at 11:38 am and is filed under Metrics, Music. You can follow any responses to this entry through the RSS 2.0 feed. You can leave a response, or trackback from your own site. That B section of NETTLETON is the same as the chorus of #335 _Return Again_, isn’t it? Opal clearly has good taste. 312b’s a great song. The beginning of the B section of Nettleton has exactly the same figure as the beginning of the chorus of Return Again, but then they diverge. So, more than a family resemblance. Yes, thanks. 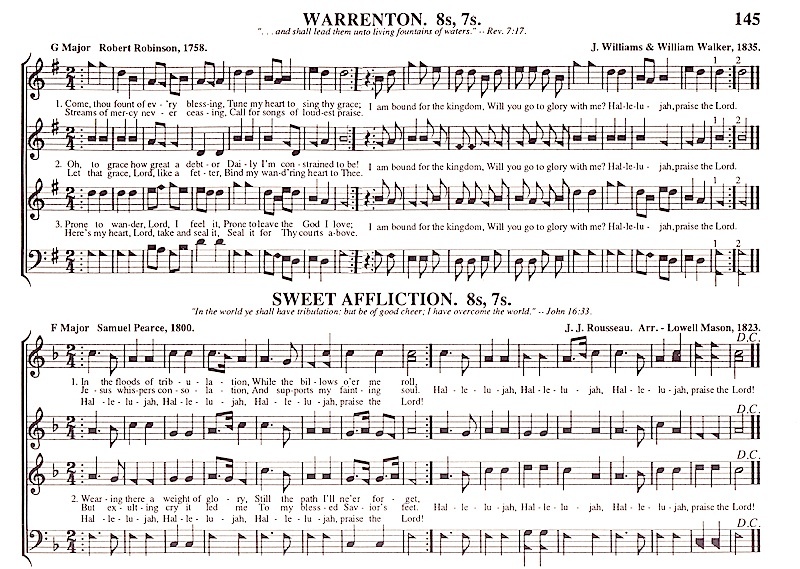 The way I’d view it is that NETTLETON goes back to its A music after the two phrases on the “Return again” tune. Oh, I see that this (D.C.) is how it’s written out in its Christian Harmony appearance as “The Good Shepherd” (p. 509 in the 2010 edition). You may have seen all this for yourself, but thanks for leading me to explore it. Do we assume that the phrase was borrowed from NETTLETON for “Return Again”? Maybe I’ll ask the hymn-tune experts on the Fasola discussions list. Next time you are in New York, you’ll come and sing with us, won’t you? Do we assume that the phrase was borrowed from Nettleton for “Return Again”? That would be my guess, but it all depends on the history of the tunes — and for that we need the knowledge of hymn-tune experts.